They're the reason that the Disney Frozen soundtrack has already sold more than 1 million units. They're also why this Walt Disney Animation Studios production has -- after 12 weeks of being in theaters -- seen a sudden resurgence in domestic ticket sales. As thousands of people rush back to their local multiplex so that they can then take part in the new sing-along version of this Oscar-nominated film. But did you ever wonder what the inspiration was for Frozen 's songs? How Bobby and Kristen-Anderson Lopez were able to create the first movie soundtrack since 2003 to sit at the top of the charts -- No. 1 on the Billboard 200 -- for four non-consecutive weeks? I mean, when you make music that's No. 1 on iTunes in more than 30 countries, you have to be doing something different, right? Like perhaps hiding in some Norwegian ice cave and then waiting for inspiration to strike? Truth be told, there were no inspirational trips to Norway involved with the creation of Frozen's score. To hear the Lopezes talk, all of these extremely hummable tunes have rather humble origins. "We were brought on board this project back in November of 2011. Right after Jennifer Lee and Chris Buck, the co-directors of Frozen, had decided that Elsa and Anna were actually sisters. But since Bobby and I live in New York and Walt Disney Animation Studios is headquartered in Burbank, Calif., we telecommuted," Kristen explained. "It just became part of Bobby's and my daily routine. That -- for two hours or so each weekday -- we'd teleconference with Jenn & Chris. Just to make sure that the songs that Bobby and I were writing always serviced Frozen's story." 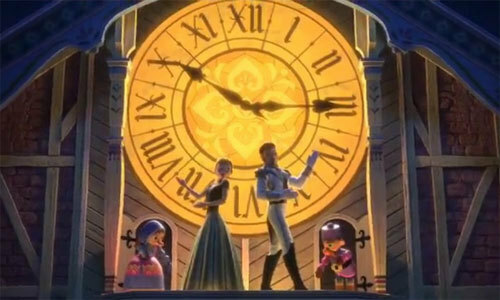 In the end, the Lopezes wrote more than 30 songs for this full-length animated feature as they tried to get a handle on Frozen's fairytale characters. Looked for ways to make Elsa and Anna realistic and relatable to modern moviegoers but -- at the same time -- giving them legitimate reasons to sing. 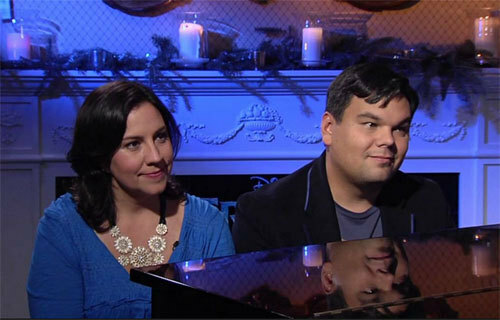 It wasn't until Bobby and Kristen wrote "Let It Go" that the style and the tone of the rest of Disney Frozen's score finally revealed itself to the Lopezes. But even then, most folks might be surprised about how Bobby and Kristen were able to creatively channel the exact emotions that Elsa was feeling at this precise moment in the story. "I mean, think about it. The people of Arendelle had just put poor Elsa up on a pedestal ... Well, on a throne, actually. And she was exalted at her coronation as being so perfect and wonderful. But the moment that Elsa revealed that she was a little bit odd, everyone turned on her and then chased her out of the kingdom. And as it happens, the inciting event was her own sister Anna's betrayal. So Elsa's inner monologue at this part of the motion picture had to be 'Screw my family. Screw all of these people that I have been trying to be so perfect for.' And we then had this great piece of concept art which showed Elsa alone on that snowy mountaintop," Kristen said. "So to have Elsa alone at the top of that mountain and finally be able to let loose with this magical ability that she's been repressing for all these years. Once all those elements were in place, the song just kind of wrote itself." But how exactly were the Lopezes able to put themselves in the sort of emotional place that one needs to be in if they're writing a power ballad like "Let It Go"? "We tried to find the modern day equivalent of what had just happened to Elsa and then plug ourselves into those emotions. So as Kristen and I were working on 'Let It Go,' we pictured Elsa as this straight-A student who had somehow just flunked her first test. And as a direct result of that, the pieces of her life now start falling apart. She's now not going to get into the college of her choice and then land that dream job," Bobby said. "How would a young woman -- who'd worked so hard for so long to please all of the other people in her life -- react if they suddenly found themselves in a situation like that? Every time I thought of that series of emotions, I have to admit that I was inspired." And Bobby and Kristen used that trick a lot as they tried to come up with a series of songs for Frozen that -- while they always serviced this film's story -- still managed to make these fairytale characters relatable to modern moviegoers. "Take -- for example -- 'Love is an Open Door.' We wanted to make the audience understand why Anna might move so fast with Hans. The scene that came right before this song in the movie had Anna talking about the pain of her upbringing and the isolation that she had experienced. Which resulted in this need for connection that Hans immediately fulfills," Bobby said. "And once these characters revealed that they had both had tough childhoods ... Well, that then gave Hans and Anna something in common. Which meant that these two characters could now find escape in one other. Which is why Kristen and I then tried to make 'Life is an Open Door' a song about the greatest first date a young man and a young woman could ever have." "I have to say that -- as a woman -- I have dated guys like Hans. I've been on that date where you sing karaoke 'til three in the morning and then you find -- three weeks later -- that you've moved in together. And you then spend the next three years trying to figure out how to move out," Kristen laughed. "I wanted to recreate that situation in this song. Where you leap without looking." Of course, not every song for the score of Frozen was a struggle. Some came about simply by observing what was already going on inside of the Lopez household. "When it came time to write 'Do You Want to Build a Snowman,' Bobby and I didn't have to do any research for that song at all. As a sister myself but now as parents of a 8-year-old and a 4-year-old, we know a lot of about what's going on on both sides of that door. And we were excited to be able to channel that musically," Kristen said. But now that Frozen is such a huge success (How big? Walt Disney Records is actually planning on releasing this film's soundtrack on vinyl in March. Which means that this double-gatefold with its three 12-inch color LPs is sure to a highly sought-after collectible among audiophiles) and there's already talk of taking this Walt Disney Animation Studios production to Broadway, what's next for the Lopezes? Well, I'll tell you this much. Bobby and Kristen won't have to go far if they're looking for additional songs to fold into the stage version of Frozen. "If you pick up the two-disc deluxe edition of this movie's soundtrack, you can hear at least five of the songs that we wrote for Frozen that wound up getting cut for one reason or another," Bobby stated. "And there's the trolls. They used to have a much bigger part in this movie. You see, there used to be this whole prophecy that drove Frozen's story and the trolls were the characters who were supposed to deliver that prophecy." "So while we were working on this film, we must have written four different troll songs. But until all of the moving parts of Frozen finally came together, we didn't really know what the trolls' overall role in this film's story was," Kristen concluded. "So if we now wind up doing Frozen 2 or do a Broadway version of this movie, we at least have all that troll material to fall back on."